Almond milk is a plant milk manufactured from almonds with a creamy texture and nutty flavor, although some types or brands are flavored in imitation of dairy milk. It contains neither cholesterol nor lactose, and is often consumed by those who are lactose-intolerant and others who wish to avoid dairy products, including vegans. Commercial almond milk comes in sweetened, unsweetened, plain, vanilla and chocolate flavors, and is usually fortified with micronutrients. It can also be made at home using a blender, almonds and water. Sales of almond milk overtook soy milk in the United States in 2013, and by May 2014, it comprised two-thirds of the US plant milk market. In the United Kingdom, almond milk sales increased from 36 million litres (7.9 million imperial gallons; 9.5 million US gallons) in 2011 to 92 million litres (20 million imperial gallons; 24 million US gallons) in 2013. In the Middle Ages, almond milk was known in both the Islamic world and Christendom. As a nut, almonds are permitted for consumption by these religions during Lent. Medieval historian Carolyn Walker Bynum notes that "Medieval cookbooks suggest that the aristocracy observed fasting strictly, if legalistically. Meat-day and fish-day recipes were not separated in medieval recipe collections, as they were in later, better-organized cookbooks. But the most basic dishes were given in fast-day as well as ordinary-day versions. For example, a thin split-pea puree, sometimes enriched with fish stock or almond milk (produced by simmering ground almonds in water), replaced meat broth on fast days; and almond milk was a general (and expensive) substitute for cow's milk." In Persian cuisine, an almond milk based dessert called harireh badam (almond gruel) is traditionally served during Ramadan. Popular brands of almond milk include Blue Diamond's Almond Breeze and WhiteWave Foods' Silk PureAlmond. Within the Italian regions of Sicily, Apulia, Calabria, and Campania, almond milk is a protected traditional agricultural product. If unfortified, almond milk has less vitamin D than fortified cows' milk; in North America cows' milk must be fortified with vitamin D, but vitamins are added to plant milks on a voluntary basis. Because of its low protein content, almond milk is not a suitable replacement for breast milk, cows' milk, or hydrolyzed formulas for children under two years of age. 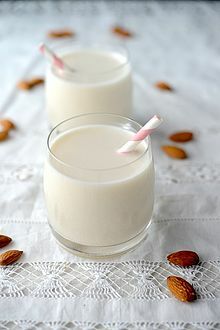 The basic method of modern domestic almond milk production is to grind almonds in a blender with water, then strain out the almond pulp (flesh) with a strainer or cheesecloth. Almond milk can also be made by adding water to almond butter. In July 2015, a class action lawsuit was placed in New York against two American manufacturers, Blue Diamond Growers and White Wave Foods, for false advertising on the product label about the small amount of almonds (only 2%) actually in the final product. In October 2015, a judge denied the consumers' request for an injunction. The growth in consumer demand for almond milk in the early 21st century accounted for one-quarter of the US almond supply, and its use in almond butter manufacturing tripled since 2011. ^ Lincoln, Jamie (18 August 2016). "Ditching Dairy? Here's a Cheat Sheet to the Tastiest Milk Alternatives". Vogue. Retrieved 8 February 2018. ^ "Face Off: Almond Milk vs. Soy Milk". Geri Maria Harris. HoustenPress. ^ Larmer, Christina (9 January 2011). "The pros and cons of almond milk". Adelaide Now. ^ a b Rebecca Burn-Callander, "How the UK is going crazy for almond milk", The Daily Telegraph, 17 November 2014. ^ Tom Philpott, "Lay Off the Almond Milk, You Ignorant Hipsters", Mother Jones, 16 July 2014. ^ Karizaki VM (2016). "Ethnic and traditional Iranian rice-based foods". Journal of Ethnic Foods. 3 (2): 124–134. ^ David Sprinkle (19 January 2012). "With Almond as the New White Milk, Dairy Alternatives Make Further Inroads". Marketwire. Archived from the original on 23 October 2014. Retrieved 14 October 2014. ^ a b Wong, Venessa (21 August 2013). "Soy Milk Fades as Americans Opt for Drinkable Almonds". BusinessWeek. Retrieved 14 October 2014. ^ Senarath Dharmasena, Oral Capps, Jr., Brooke Kosub, "Demand and Market Competitiveness of Almond Milk as a Dairy Alternative Beverage in the United States" Archived 24 April 2016 at the Wayback Machine, Department of Agricultural Economics and Agribusiness, Food and Consumer Economics Research Center, (AFCERC), Texas A&M University, 2015. ^ "Guida ai Prodotti Tipici del Territorio di Brindisi" (PDF). ^ "Milk, whole, 3.25% milkfat, with added vitamin D" Archived 16 March 2018 at the Wayback Machine, United States Department of Agriculture, Agricultural Research Service. ^ "Soymilk (all flavors), unsweetened, with added calcium, vitamins A and D" Archived 16 March 2018 at the Wayback Machine, United States Department of Agriculture, Agricultural Research Service. ^ "Beverages, almond milk, unsweetened, shelf stable" Archived 20 August 2017 at the Wayback Machine, United States Department of Agriculture, Agricultural Research Service. ^ Geoff Koehler, "Children who drink non-cows’ milk are twice as likely to have low vitamin D", St. Michael’s Hospital, Toronto, 20 October 2014. ^ Keller MD, Shuker M, Heimall J, Cianferoni A (January 2012). "Severe malnutrition resulting from use of rice milk in food elimination diets for atopic dermatitis" (PDF). Isr Med Assoc J. 14 (1): 40–42. PMID 22624441. ^ Collen, Jess (23 July 2015). "Is 2% Almond Milk More Confusing Than 2% Cows Milk? Blue Diamond And Silk Probably Say 'No.'". Forbes. Retrieved 1 February 2017. ^ Feeney, Nolan (29 July 2015). "False Advertising Lawsuit Claims This Almond Milk Brand Doesn't Have Enough Almonds". Time Inc. Retrieved 1 February 2017. ^ Steven Trader (8 June 2016). "Almond Milk Buyers Fight Stay Pending Other False Ad Deal". Law360. ^ "Class action lawsuit targets Blue Diamond, Silk almond milks". Washington Examiner. 8 June 2015. ^ Joe Van Acker (21 October 2015). "Almond Milk Makers Duck Drinkers' Bid For Label Change". Law360. ^ a b c Alan Bjerga; Donna Cohen; Cindy Hoffman. "California Almonds Are Back After Four Years of Brutal Drought". Bloomberg. Retrieved 16 April 2019.